Item Status - file upload - report on barcodes not found. Here is a wishlist bug report for a feature mentioned in bug #1798187 comment 24. In the web staff client, Item Status mode, when processing a file of barcodes, report back to the user if any of the barcodes are not found by the system. This lets the user know that there may be a problem with their data. Currently there isn't any indication to the user when some barcodes are not found when using the file upload option. I have this working locally, along with bug #1798187 (Barcodes with initial or trailing spaces fail silently when in txt file) and bug #1819367 (allow paste of multiple barcodes in CSV format into scan box). I need to try and separate the changes for the 3 bugs into separate commits. Here is a screenshot of the alert. I set it up to only show the first 30 barcodes that were not found. I don't want the alert to grow too large if there are a huge number of not found barcodes. I just arbitrarily chose 30 for the number to show. If anyone has any arguments about more or less please let me know. I figured 30 is enough for looking into what problems there are from the source data. I like the message but would prefer to either see all of them or have the ability to page through to the next 30 until all are viewed. I would probably copy the alert message so that I could follow up and find out why they didn't load. This is wonderful and very helpful! Elaine, unfortunately the egAlertDialog feature that I'm using to display the alert doesn't allow for paging or any text formatting. And I don't think my skills are up to creating a new grid view popup of the results that would add in the paging. 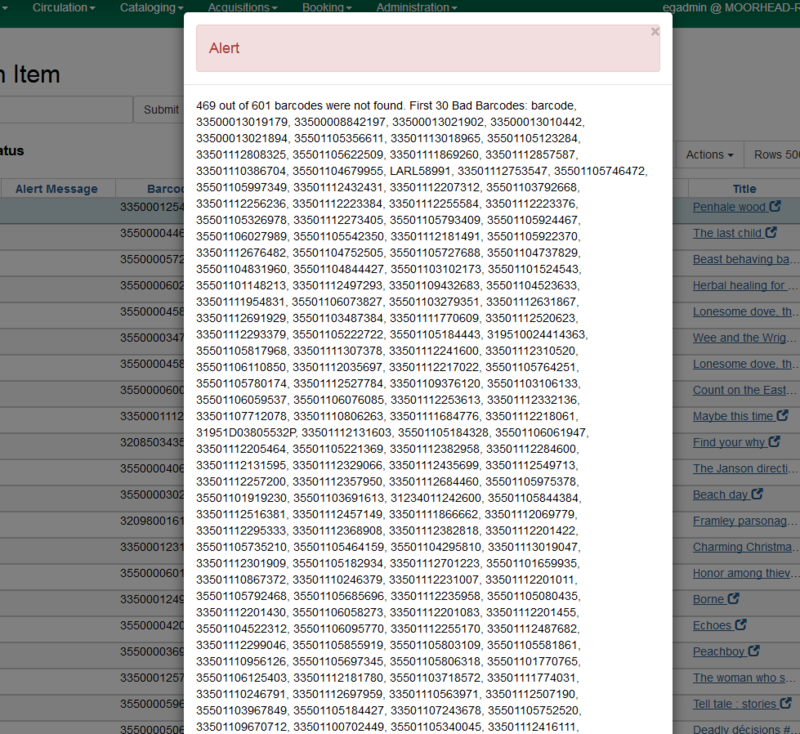 I can remove the limit and see what the dialog looks like if there are 400 barcodes in the results. Maybe it works fine. I'm a little worried about what it looks like on a tablet device. After testing.. it seems to work ok to have ~450 bad barcodes returned. The alert box just extends vertically and the page length is increased. You just have to scroll down to see it all and to reach the ok button to dismiss the alert. There is an X to dismiss the alert at the top of the alert also, so a user doesn't actually need to scroll all the way. I'm fine with just always showing all the results. I think displaying all is a better solution (you may want to remove the First 30 barcode phrase). Hopefully, one would not have a file where that many failed very often. Usually that occurs when a file of previously deleted barcodes is inadvertently uploaded.